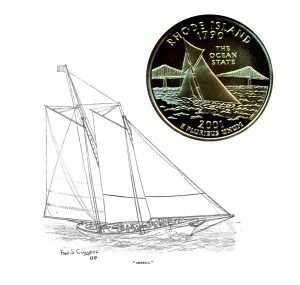 Today, the Rhode Island State Quarter Coin with her sailboat design remembers the first races by the yacht America. The first race held off the Isle of Wight was an invitational to all nations by the Royal Yacht Squadron. Not for the first, but now, this international race is known as the America’s Cup. A few days after the first race, another British yacht challenge the America, not believing the skill of the boat builder or the crew. The yacht America went head-to-head with the Titania on August 28, 1851. In 1851 there was also two days’ racing over these same two courses, with six starters on the first day, and but four on the second. This, however, was a memorable year, for this was the summer that the schooner America came out and sailed across the ocean. On Friday, May 9, 1851, at a general meeting of the Royal Yacht Squadron, a cup valued at $100 was offered for competition by yachts of all nations, the course being around the Isle of Wight, starting and finishing at Cowes; and for this race the America started against eight other schooners and nine cutters. The result is too well known to require more than a passing allusion. The America came in winner with loss of jib-boom; the three first arrivals being the America (170), at 8.37; Aurora, cutter (47), at 8.45; the Bacchante, cutter (80), 9.30. The reason of the Aurora getting so well placed at the finish was that the end of the match was a mere drift, but had there been an allowance for difference of size, the Aurora would have been beaten by less than two minutes, although, when passing the Needles, on the return, she was full eight miles astern, and the rest of the fleet out of sight astern. I may say a word in passing of the other race sailed by the America in British waters, before she was sold by her American owners. This race is not so well known as the other for the cup which still bears her name. This was a match sailed August 28, 1851, with the schooner Titania (100). The course was from the Nab to a station twenty miles away, either to the leeward or windward, as the case might be. There the first part of the race ended, and £50 was to be awarded to the winner. The yachts were then to be again started, on the return, and another £50 depended on the finish. The wind at the start was fresh from northwest, increasing to a gale, and hauling to north by west. In the runoff, the America beat the Titania four minutes twelve seconds, and in the beat back, she beat her 52m., thus winning the whole £100. The New York Clipper Annual for 1894 included an article giving the History of the America Cup from 1851 to 1893. A syndicate of patriotic and public spirited American yachtsmen, members of the New York Yacht Club, with Commodore John C. Stevens at their head, in 1850 gave to George Steers, the ship builder, a designer with original ideas, who revolutionized the art of yacht modeling in his day, an order for a keel schooner, the object in view being to march her against the best yacht to be found in English waters. Up to that time there had been comparatively little yacht racing in home waters, and when the America sailed away on her perilous voyage, with a crew of hardy, daring Yankee tars aboard, many persons, knowing the reputation of some of the foreign boats, and the greater experience of the yachtsmen of Albion, were disposed to regard her mission as foolhardy, although admiring the pluck of her owners. She crossed the Atlantic under pilot rig, and the manner in which she behaved during the trip strengthened the confidence of Commodore Stevens and his companions in her good qualities. She first proceeded to Havre, France, where she was fitted out for the object of her visit to Europe, and she lost no time in setting sail for Cowes, Isle of Wight, the headquarters of the Royal Yacht Squadron, and during the season the principal rendezvous for England’s racing and pleasure craft. “In coming from Havre we were obliged by the darkness of the night and a thick fog to anchor five or six miles from Cowes. “In the early morning the tide was against us, and it was a dead calm. At 9 o’clock a gentle breeze sprang up, and with it came gliding down the Laverack:, one of the newest and fastest cutters of her class. “The news spread like lightning that the Yankee clipper had arrived, and that the Laverack had gone down to show her the way up. “The yachts and vessels in the harbor, the wharves and the windows of the houses bordering on them, were filled with spectators, watching with eager eyes the eventful trial. They saw we could not escape, for the Laverack stuck to us, sometimes laying to and sometimes tacking around us, evidently showing she had no intention of quitting us. “We were loaded with extra sails, with beef and pork and bread enough for an East India voyage, and were some four or five inches too deep in the water. “We got up our sails with heavy hearts; the wind had increased to a five or six knot breeze, and, after waiting until we were ashamed to wait longer, we let her get about two hundred yards ahead and then started in her wake. “During the first five minutes not a sound was heard save, perhaps, the heating of our anxious hearts or the slight ripple of the water upon her sword-like stem. “The captain was crouched down upon the floor of the cockpit, his seemingly unconscious head upon the tiller, with his stern, unaltering gaze upon the vessel ahead. “The men were motionless as statues, with their eyes fastened upon the Laverack. The pencil of an artist might, perhaps, convey the expression, but no words can describe it. “It did not last long. “We worked quickly and surely to windward of her wake. The crisis was passed, and some dozen of deep drawn sighs proved that the agony was over. The British yachtsmen inspected the new arrival closely, and were most favorably impressed by her trim, racer like appearance; hut no one regarded her in the light of a possible conqueror of one of their crack yachts. Few of them were aware of the fact that a flourishing yacht club existed in New York, and to suppose that the Yankees were, with such limited experience, competent to produce a boat able to successfully compete against the finest specimens of British genius and skill was regarded as quite absurd. It was the desire of the Americans to test their schooner against any single yacht in a match race, and, accordingly, a challenge was promptly issued to race her for from one to ten thousand guineas, the only stipulation being that the race be sailed in a six knot breeze. The challenge received no response, and, as a last resort, it was decided to enter the America for the annual regatta of the R. Y. S., for a £100 cup, open to all nations. Schooners— Beatrice, 161 tons; Wyvern, 205; Constance, 218; Gypsy Queen, 160; Ione, 75; Brilliant, a three master, 392, and America, 170. Cutters— Mona, 82; Volante, 48; Arrow, 84; Alarm, 193; Bacchante, 80; Freak, 60; Eclipse, 50, and Aurora, 47. The America was last to cross the line. She started wing and wing, mainsail out on one side and foresail on the other, and she soon passed through all the fleet save the Arrow, Beatrice, Aurora and Volante. Superbly handled, however, she gradually overhauled these also, and, under the impetus of a good six knot breeze, she assumed command before reaching No Man’s Land buoy. She had demonstrated her superiority in going with the wind free, and she emphasized it when it came to windward work. In fact, so rapidly did she work to windward that by the time the Point was reached not a yacht was in sight from her decks. The wind now died down, and a strong head tide was encountered, against which the America made little head way. At St. Catherine’s the Arrow went aground and was out of the race, hut the Aurora still held on. The wind now began to freshen again, and the America drew rapidly away from the cutter. After getting by St. Catherine’s the America had a leading wind, and, easing off her sheets, flew rapidly up toward Cowes. Just before passing St. Catherine’s her jib boom was carried away. The America had a large and well trained crew on board, and the wreckage was speedily cleared away. By the time she passed the Needles the nearest boat, the Aurora, was about eight miles astern, and the rest of the fleet not in sight. The wind now became light again, and, though the America passed the Needles at 5.40 o’clock, it was 8.37 before she dropped her anchor, a winner, off the Royal Yacht Club’s castle at Cowes. The Aurora got in at 8.55. The America’s time was 10h. 37m. The defeated fleet of British yachts did not all get in until the day after the race. Many of them became discouraged and anchored when night overtook them. The America was well handled throughout the race. From start to finish she showed her superiority over the British yachts in every respect. The answer said to have been given to a question from a high personage of “Who was first?” “The America.” ‘”Who is second?” “There is no second” was literally true. The start and finish of the regatta was witnessed by many members of the nobility and even Queen Victoria did not deem the occasion unworthy of her distinguished presence. After passing the Needles the royal steam yacht Victoria and Albert, with Her Majesty and family on board, overtook the America and as the steamer passed slowly by the Americans tendered their homage to the sovereign by dipping their flags. Subsequently the America proceeded to Osborne where the Queen, with Prince Albert and suite, inspected her. Commodore Stevens effected a match between the America and R. Stephens’ cutter Titania, 100 tons, for $500 a side, which was sailed on Aug. 28, in heavy weather, the Titania being beaten almost an hour. The Rhode Island State Quarter Coin shows with an artist’s image of the first America yacht.